Refined by nearly two decades of use in American churches, these songs for liturgy will continue to enhance liturgies for years to come. Change Our Hearts represents some of the best work from liturgical songwriter Rory Cooney in collaboration with his wife, Theresa Donohoo, and longtime friend and colleague Gary Daigle. It contains songs that have been anthologized in hymnals and missals such as Breaking Bread, Music Issue and Glory & Praise, Second Edition. The arrangements have been refined by nearly two decades of use in American churches, and all the songs have been re-recorded to take full advantage of the evolution of the arrangements and advances in technology. The songs are taken from Rory's earlier collections You Alone, Do Not Fear to Hope and Mystery; many are now available for the first time on CD. 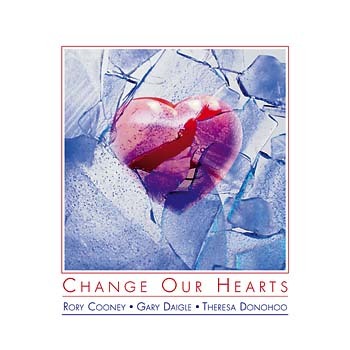 Change Our Hearts represents some of the best work from liturgical songwriter Rory Cooney in collaboration with his wife, Theresa Donohoo, and longtime friend and colleague Gary Daigle. It contains songs that have been anthologized in hymnals and missals such as Breaking Bread, Music Issue and Glory & Praise. The arrangements have been refined by nearly two decades of use in American churches, and all the songs have been re-recorded to take full advantage of the evolution of the arrangements and advances in technology. The songs are taken from Rory's earlier collections You Alone, Do Not Fear to Hope and Mystery, with many now available for the first time on CD.